Happy Halloween! Today I'm sharing the cards I made for our three Grandsons. 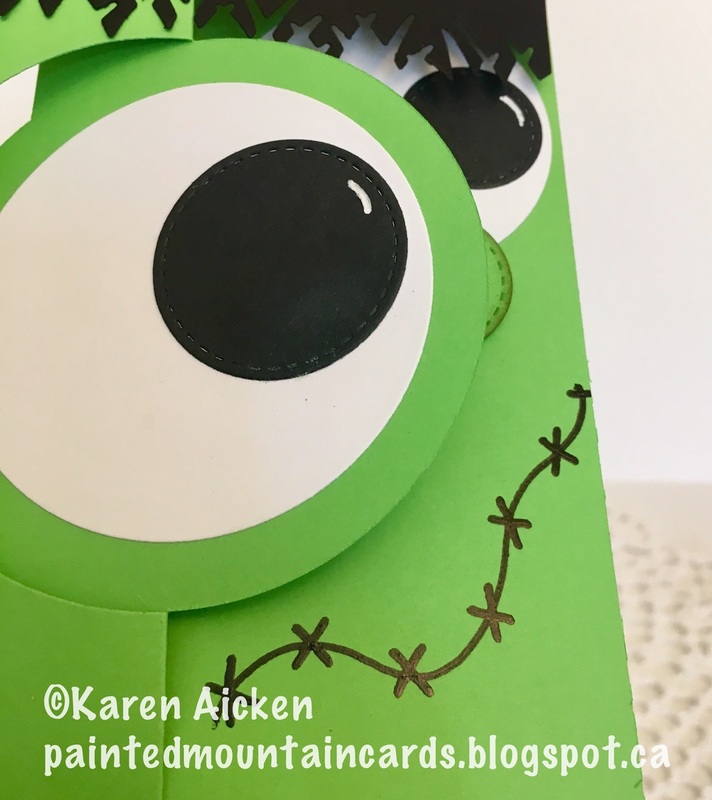 I had so much fun making these Flip-It face cards! These were all over Pinterest several years ago and since I decided to finally make them I chose the October 2013 post at Paper Ecstasy for my inspiration. First up is Franken Flip-It. EEK. I drew his stitched mouth and scar with a black glaze pen, so they are slightly raised and shiny. Seriously, these were fun. I was grinning the whole time. Finally, here is a Ghost Flip-It. For this one I chose Karen Burniston's older Spiral Circle Pull Card for the card base, and I liked the way it worked for this type of card. When you use the SCPC, it doesn't cut into the card back and I liked that look better. 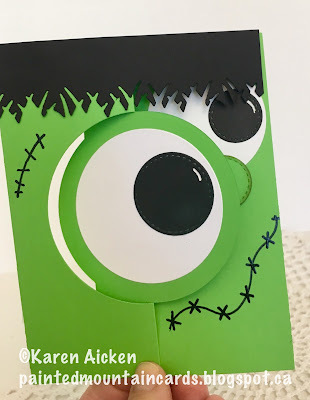 You can compare the inside of the Ghost card with the Frankenstein and Dracula insides above. Oh, and when I cut the ghost, I chose not to cut the notches that hold the SCPC in the closed position which gave me a clean base to add the face to. Whew - I have a photo heavy post today! In an earlier post, I said I was going to simplify the cards I make for our five Grandkids in October, because they are getting cards for both Thanksgiving and Halloween. That's 10 different cards from me, and I make my Mom's cards as well ... so that's 20 different cards given to the grands in October. They love getting cards though, so no way we are not going to make them. 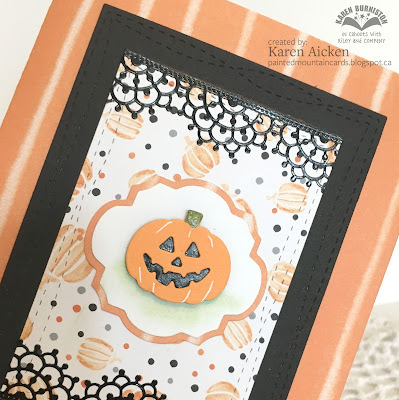 I picked up some of the Stampin' Up 3 x 3" envelopes with my order last month, and even though I was finished my Halloween cards for the year I was inspired to make a set of 5 to give them next year. 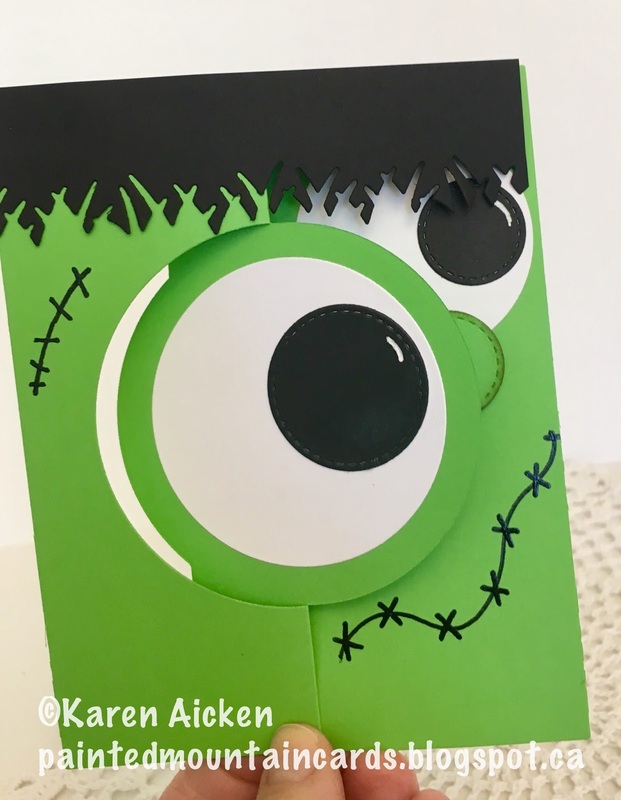 Ha - so I'm 5 cards up for Halloween 2018. Don't hate me. Card #1 ... The witch hat and Jack-O-Lantern were fussy cut from different papers in the package, and the BOO! is a die cut from Karen Burniston's Halloween Elements. 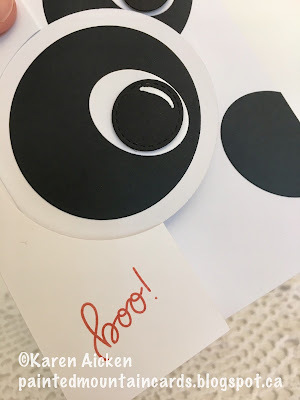 I added oval wiggly eyes to the 'o's in BOO because kids love wiggly eyes! Inside is a floating ghost and creepy hands ... 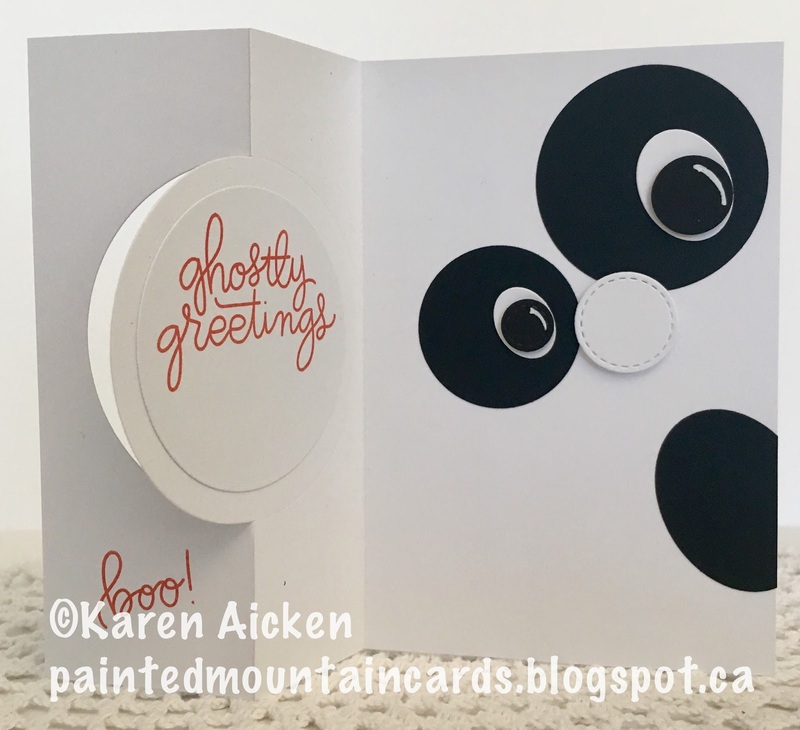 I animated the ghost using the spinner die from the Rectangle Pull Card. That die set has been discontinued, but it's still fun to use. 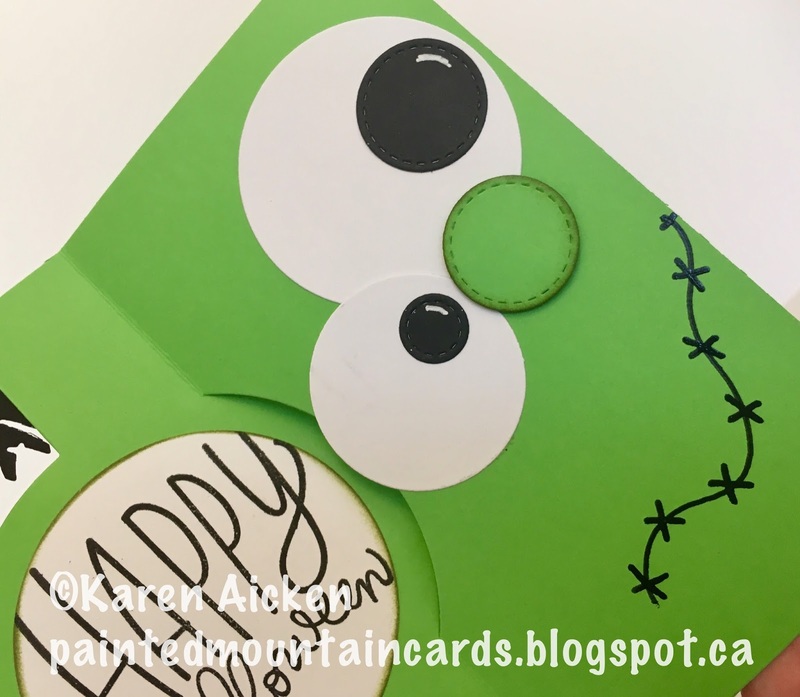 Card #2 - a stamped and fussy cut witches hat perches above wiggly eyes and the whole white stitched circle is adhered to the card on an Action Wobble. Love how it bobs around - another thing that kids seem to enjoy. The inside has a stamped label, layered with a stitched die cut banner and a fussy cut Jack O Lantern. Card #3 features a printed 3" square panel and a punched cat. Both the cat punch and all the patterned paper used are by Stampin' Up and were in the bundle I purchased. You will be seeing a lot of this cat punch in future cards! Even though I'm a dog person, I am really enjoying this cat punch. The patterned paper came with a sheet of printed cats sized to work perfectly with the punch. A black satin bow and the card front was done. Inside is a stamped and punched cat and I used the Pop-Up platform from Karen Burniston's Tree Pop-Up to animate the cat inside. This card will likely go to Olivia, who especially likes Pop-Up cards. Card #4 was really fun to make. 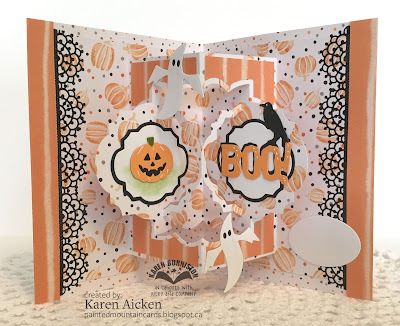 I used the Jack O Lantern face that comes with the pumpkin in Karen Burniston's Halloween Elements, only I just used the face die to cut three faces into the front of my black card. 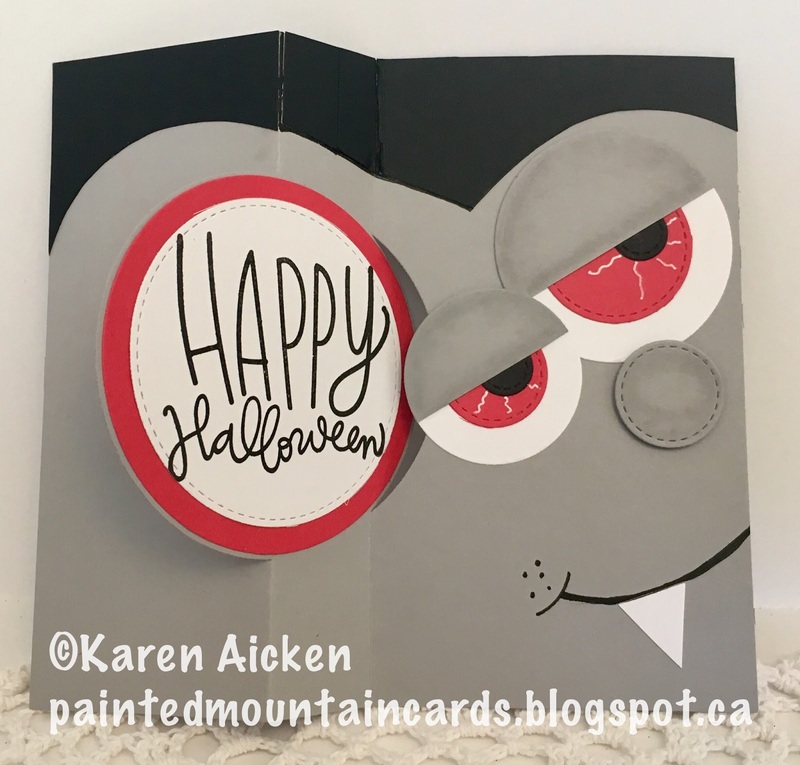 So fun - I've been wanting to try this on a larger card, so have to remember this idea for next year. I backed the faces with orange card stock inside the card. 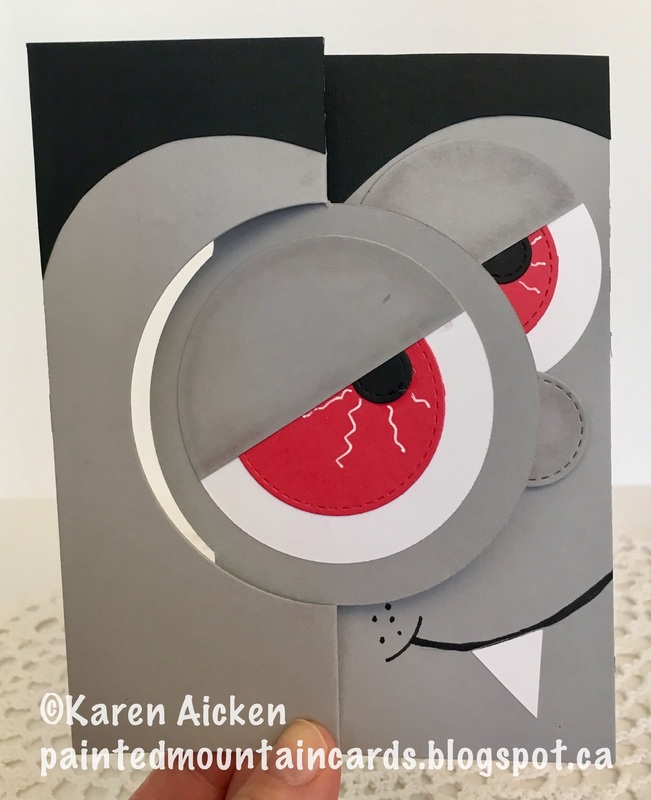 Here is a look at the inside, with a stamped and fussy cut owl with wiggly eyes, a fussy cut witches hat and a die cut branch. 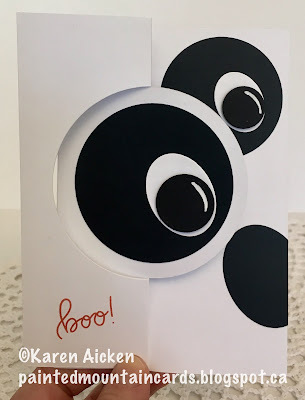 I have really enjoyed this stamp set - the eyes, Happy OWLoween stamp is included in the set. Card #5 has another one of those printed 3 x 3" scenes. There were two 12 x 12 sheets of them in the paper package so it was easy to cut those sheets into 3 x 3" panels to have on hand for quick cards. I added another punched cat and a fussy cat witches hat but this one has some doodles added. The BOO! was die cut from the orange circle, backed with black card stock and I carefully added the centers from the B and both O's back in. The orange BOO! was set aside to use on a different project. Then, the whole orange circle was adhered inside the card with an Action Wobble. It's always a fun surprise when they are inside a card. Thanks for hanging in with me to the end. The cards were quick to make and I think the Grands are going to like their small size. They fit in the little envelopes quite nicely. I actually stamped a label on each envelope to write their names on the envelope, but didn't take a photo. Branch die - Memory Box? 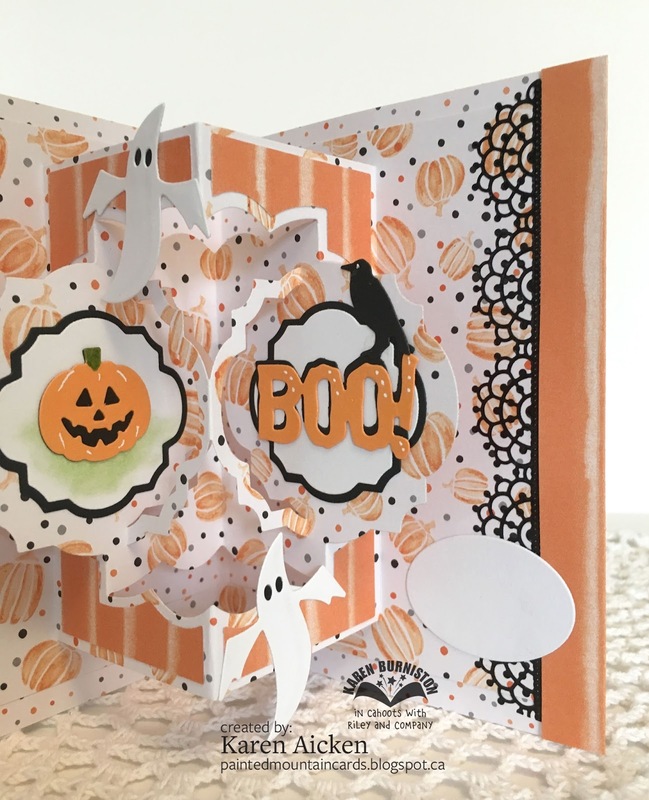 Last season I had been working ahead on my Halloween cards for this year, which is why the photos are water marked with my old blog. Midnight the Bat is one of Karen Burniston's older licensed products, but he is SO cute I can see me continuing to play with him. Midnight has wiggly eyes, sparkly ears and bow tie and is perched on an Action Wobble so he bobs and wobbles around on the card. It's Saturday so that means a new challenge at the Crazy 4 Challenges Blog. Bonnie Sharp is our October 2017 hostess, with Marcie Sharp as our Guest Designer this month. You can find Marcie's blog HERE. This is Bonnie's challenge: I'm sure you all know that October is Breast Cancer Awareness month. My challenge to you is to create an inspirational card using pink somewhere on your creation! Bonus points if you send your card to someone needing a hug! Last month I got to spend the day with Eileen Hull. I took her to a funky little scrapbook store called The Scrap Yard as I wanted to show it off to her. While we were poking around I found this gorgeous patterned paper sheet by Alexandra Renke ... if you follow my blog you know I am a fan of this artist's papers and was in fact introduced to them earlier this year by Lori, the shop's owner. 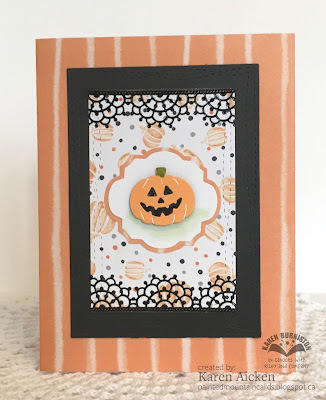 For the outside of my card, I went through the stamps I have that would work for the challenge and decided on this older one by Riley & Company. It isn't specifically for Breast Cancer, or any other Cancer - but it still worked. I paired it with a lovely die cut poppy, embossed pink panel and a die cut stamped pink ribbon. I made a Distress Oxide background to cut the ribbon from, and also the heart and butterflies inside. Once again I used the Katherine Label Pop-Up by Karen Burniston - only this time I used the card in a vertical position instead of horizontal. Inside is where I used that beautiful watercolored paper. I actually bought the paper for a C4C challenge on November 11th but only needed half the sheet for that card. The remaining piece worked out for this card so I managed to use the whole sheet! Man, I love not having any scraps to have to deal with. Thankfully I didn't need to make it for anyone specific right now and I'm fine with it sitting in my stash and not ever needing to send it. Check out the C4C blog to see how the Crazies have been inspired by the challenge. We'd love to see your take on it, so be sure to stop by the Crazy 4 Challenges blog and link up your creations. If you are uploading to an online gallery, please use the keyword C4C 409. It's Flip-It Friday here on my blog and I have a layered up Flip-It card to share today. The card base is a Triple Circle Flip-It's and I used up the last of this patterned paper by Echo Park. Boy, I love to use things up. There was actually one small piece of the striped paper leftover, so I punched banners from it and set them aside to add to different projects here and there. Here is the inside, and we wrote write our message on the little apple decorated label. 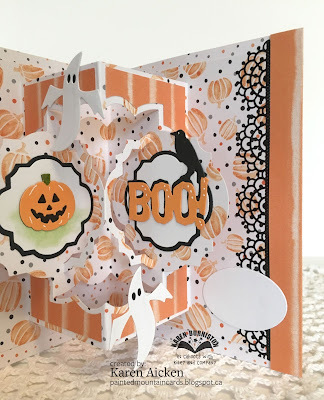 I have a cute Halloween card to share today, but I have used this Block Card die set in a horizontal orientation instead of vertical. The reason was I had this piece of patterned paper with the eyes leftover and this is the direction they were going. The pumpkin embellishment is on an Action Wobble so it bobs and wobbles around. 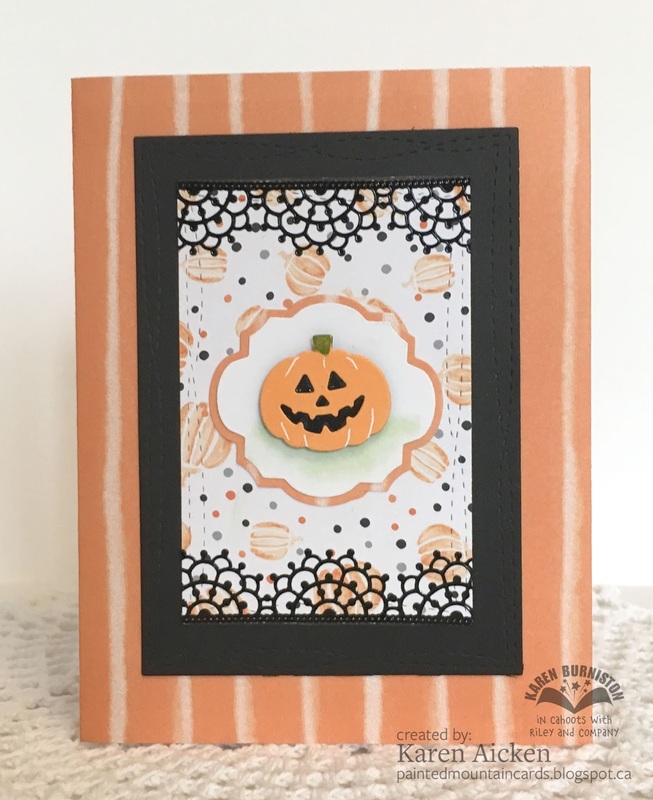 I really enjoyed using the Doodlebug papers and embellishments for Halloween cards. This one was actually done last year (note the watermark is from my old blog) but I didn't get it made until after Halloween so also didn't post it last October. I guess at that point I hadn't decided for sure to move my blog here. Ooooh, this patterned paper was on the Clearance Rack at Stampin' Up and I couldn't resist. LOVING the soft patterns in the package and of course I wish I'd purchased more than one. 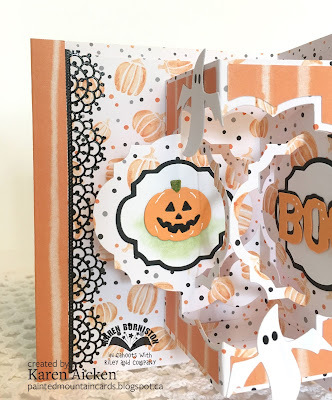 I used the pumpkin from Karen Burniston's Halloween Elements, die cut labels and lacy peel-off stickers that always make me think of spider webs for Halloween. 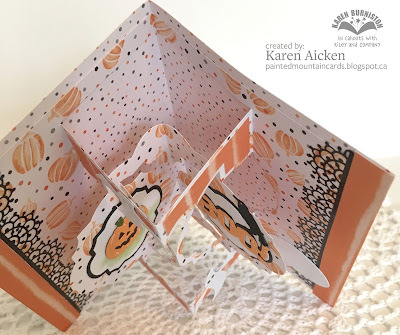 I really like this older Pop-Up die by Karen Burniston. Even though it has been discontinued through Elizabeth Craft Designs, I have my fingers crossed it could be re-released with her new company and partnership. I'm talking about the Anita Frames Pop-Up. So much OOOOOOOH in this pop-up! when the card is opened! I actually cut the patterned paper on the front wider, and wrapped the edges around to the inside. 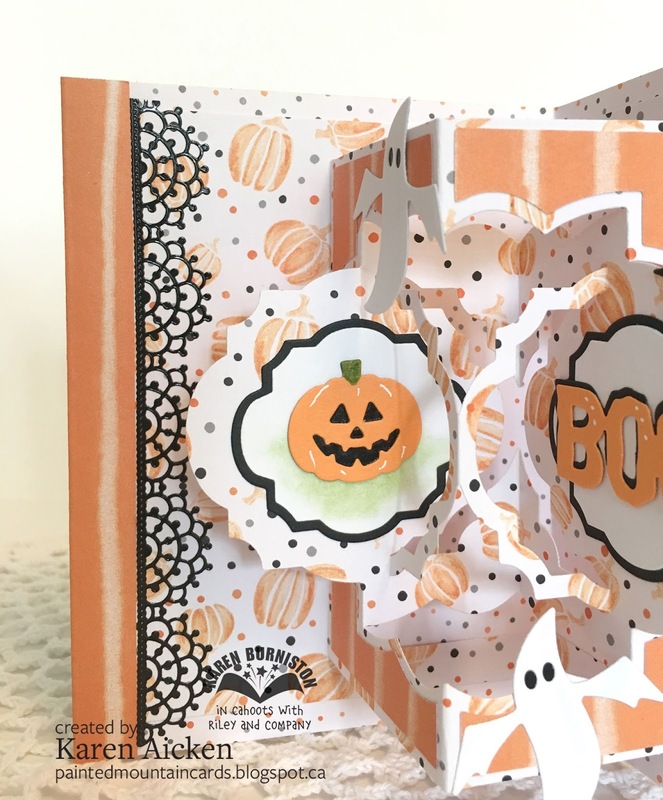 Then I added more die cuts from the Halloween Elements die set. It always amazes me when you can get this much dimension in an A2 card. Just wow!